The ParaEq w/Boost gives musicians a powerful, musical, high quality EQ in a conveniently small package. The signal path of the ParaEq w/Boost is comprised of the highest quality components chosen for their transparency, powerful tone shaping capabilities, and low operating noise. 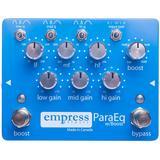 With the Empress ParaEq w/Boost your instrument will still sound like your instrument, only better. 3 bands of parametric EQ, each with 3 selectable q widths, give you extremely flexible EQ. The wide Q is great for general tone shaping and is extremely transparent. The medium Q is perfect for everyday problem solving like pulling out boxiness from the low mids to reducing harshness and adding bit in the upper mids. The narrow Q excels at notching out problem frequencies and is a saviour for acoustic guitarists when combating feedback issues. The Boost section offers 30dB of clean boost and can be set to engage with the EQ section to act as a make-up gain when doing subtractive EQ, or can be used completely separately as a pure clean boost. Great for bumping up your volume for solos or hitting the front end of a tube amp for a bit more break-up. All Analog Signal Path – to deliver the most organic tone possible. Ultra Transparent Sweet Sounding EQ – enhance your sound without masking the tone of your instrument. Lots of Control - with switchable q, fully over-lapping sweepable frequency selection, and 15dB of cut and boost you’ll get all the control you need. Ultra-Quiet – You’ve come to expect our pedals to be noise free and we’ve delivered once again. If you put this at the front of your chain and boost a bit you’ll also cut down on the noise your other pedals are introducing. Loads of Headroom - Internally switchable to run off 9/12/18V power supplies. 30dB of Boost - making it an ideal candidate before long effects chains and overdriving tube amps. Pristine Clean Sound – We measured the distortion to be less than 0.03%. Pretty remarkable for a guitar pedal. True Bypass - The Empress ParaEq w/Boost EQ Pedal employs true bypass, so you can be sure that it's not affecting the signal when disengaged.